Yelp will not show these reviews as their computer algorithm blocks them. You can view a copy of the report HERE. In reviewing the report, I can not see where I used any fake tools. I used a ladder to access the roof and attic as the Texas Real Estate Commission (TREC) requires me to do so. I used a screwdriver to open the electrical panels as TREC requires me to do so. I used a water pressure gauge to check the water pressure as TREC requires me to do so. I used a flashlight to see in the dark areas. I used an electrical receptacle tester as TREC requires me to check for grounding and polarity at every accessible receptacle. There were items that may not have been required in 1920 when the house was built, but are considered safety items or items that TREC requires inspectors to comment on and mark as defective. These items may include the lack of rescue/escape openings, lack of stair handrails, lack of labeling at the electrical panels, the presence of knob and tube wiring, lack of Ground Fault protection (GFCI), lack of Arc Fault protection (AFCI), grounding, bonding, lack of smoke alarms, lack of carbon monoxide alarms, bathroom ventilation, lack of backflow preventers, and more. Had this person contacted me, I would have explained everything to her. So when you go to Yelp, always look for the reviews that are not recommended.. I wonder how many clients I have missed out on because of Yelp. Since the review was posted, I have only 1 client mention Yelp. 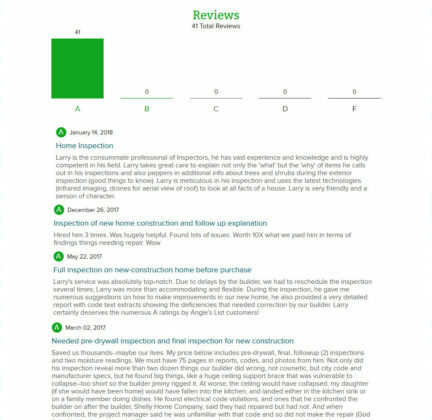 He hired me because of my reviews at Angies List. ALL of them are 5 stars .